The following books are a few of the many I have read. These are here because of my personal connection with each of the authors. I offer them here as a sampling for you. If you wish to purchase, simply click on the picture of the book to be taken to Amazon.co.uk (these are affiliate links). Each page is fully researched and academically grounded AND it is full of heart. It’s presented like a series of essays on each stage of childhood, peppered with practical tips on different topics linked together with the thread of wisdom that we can as parents have a huge influence on the next generation. Marcy writes beautifully and is very eloquent in explaining why, backed up by modern neuroscience, we simply need to be loving, kind and considerate to our children which is of course hard to do after a long day, they are tired, hungry in the throes of a tantrum and you have zero resources to cope. And I believe that what is painted here will help you cope. It gives a bigger picture to draw on when the cards are down! 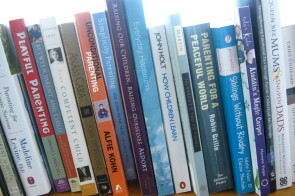 With work Marcy and I have done together I have put together the peaceful parenting e-course. This is another wonderful author with whom I have had the pleasure to work with. We worked with a group of parents and applied the Playful Parenting approach combined with The Work of Byron Katie to undo the underlying beliefs with great success. We recorded our sessions and they are available here: Playful Parenting. Seeing that play is the key to communicate, connect and be creative with your children is his message. Adding love and humour through play is Dr. Cohen’s gift to parents. His book is wonderfully practical and creative. With his formula for a peaceful home being – SIMPLIFY – Kim John Payne writes a beautifully crafted treatise on why less is more when it comes to bringing up children. I was so moved by his book that I enrolled and trained as a simplicity parenting group leader and have done a huge amount in my own family to create more rhythm, better more balanced schedules, less (none in term time) screen time and fewer toys. I’ve loved having a de-cluttered home and it appears my children have loved it too. Jesper Juul’s book came as a gift just after I had given birth to my third baby. His work with “family labs” is only just beginning to be known of in Scotland, but in Denmark he is famous for his down to earth, practical respectful approach to parenting children. As ever he looks not at the child, but the parents when there is a “problem”. He is wise, caring, understanding and fully attuned to what issues parents face. I have seen him talk at a Children in Scotland Conference and he is down to earth, humourous and grounded in his approach to parenting or working with children. This book crosses a lot of territory and challenges a lot of mainstream thinking. He is fully researched, has the evidence to back up the information he gives and when sitting with it myself, I found it made a huge amount of sense. He argues that approach to children which is all about sticker rewards, star charts, competition and “well done” doesn’t work. This is because performance based criteria is demanding and by creating external rewards any internal intrinsic pleasure inherent in doing a certain task is lost for the child. Read this book and you may never praise your child in the same way again !